On Saturday, thousands of UNISON members took to the streets and made our voices heard. UNISON was by far the biggest, noisiest presence on the march – and swamped Hyde Park for the rally afterwards. 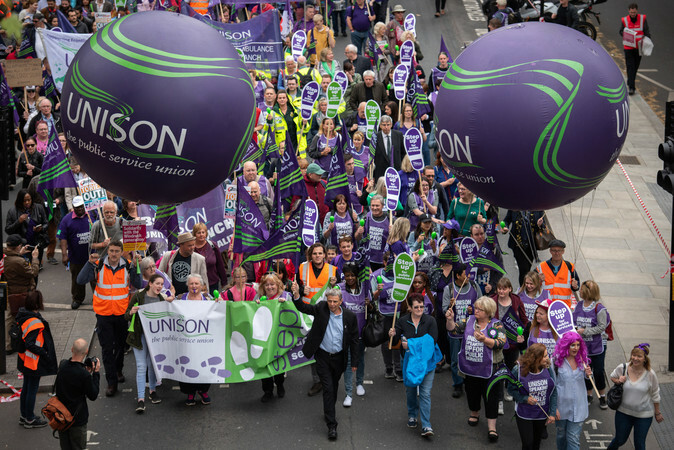 Our flags, t-shirts, balloons – and even a samba band – helped turn London purple, and showed that UNISON members are ready to step up and fight for better public services. I am so proud to be here with you as General Secretary of UNISON. UNISON’s purple and green colours and banners swamping Hyde Park. And we in UNISON march today on behalf of all public service workers in this country. UNISON members here today in their thousands. UNISON members who have suffered a decade of brutal austerity. Austerity imposed by a Tory government, which does not care what damage it causes to people’s lives. The bank crash caused by the greed of the rich and powerful. Caused by the self-appointed masters of the universe. Their greed still being paid for by low-paid public sector workers. Paid for by our people, our class. That’s why we, in UNISON, with one voice, are marching today. To demand change. To stand up for our jobs, for our communities. We are marching today to tell this vicious Tory government once and for all – it’s time to end austerity, it’s time to end the privatisations, it’s time for this vicious Tory government to go! Our members in UNISON, over a million of them women, earning less in a year than the rich earn in a day. They’re worried. They witness every day of their lives the tragic impact of these brutal cuts. The sick and the elderly who don’t get the care they need. The children and young people left behind and out of work. Our communities, blighted by unemployment and poverty, all because of vicious political choices by a tory government that has shown itself, time and time again, to be callous and cruel. It’s our people, our class, who suffer. They suffer whether it’s the residents of Grenfell Tower – victims of an avoidable tragedy and still homeless a year on. A scar on this city. A source of deep national shame. They suffer whether it’s UNISON members – the care workers, the nurses, the teaching assistants – battered by cuts yet always expected to do more with less. They suffer whether it’s the Windrush generation, losing their jobs, denied the care they need, put in detention centres, driven from this country and told to “go home” by a callous, racist government. You remember the Tories said they wanted to create a hostile environment? Well we, here today, we will give them one! We’ll create a hostile environment for Theresa May. A hostile environment for her racist government. And a hostile environment for their politics of austerity, their politics of greed, their politics of hate! Our people and our movement are fighting back. Today we march, and we will keep on marching. We will keep up the pressure, because (and they know it) we are now the majority in this country today – not just you here today – but the millions throughout the land. Millions who believe in honesty, decency, compassion and a fairer society. Millions who know that what this Tory government is doing is wrong. And the change we seek, won’t just sweep the Tories from office, it will sweep Jeremy Corbyn into Downing Street, it will bring our movement to power and it will change our society into one that works for the many. So be proud of who you are, be proud of what you do, and to all the UNISON members here today, be proud of your union – I am so proud of you.